After much trials and tribulations, an entire day of missed flights, airport diversions, and long immigration lines, I finally arrived in San Francisco about 8 hours later than originally scheduled. I missed the opportunity to check out a food truck or a taqueria for lunch, but that didn't matter. Upon arriving at my friend's apartment some 15 minutes before dinner time, I took a very quick shower while she helpfully ironed my crumpled dress shirt (something which she doesn't even do for her own clothes!). After a short walk of a few blocks, I eventually arrived at my destination about 20 minutes late. There was absolutely no way that I was going to miss dinner at Saison. This was the first restaurant I booked when I started planning my trip just a month ago, and would certainly be the culinary apex of my entire trip. This was the reason I re-routed my itinerary to arrive in LAX and connect to a domestic flight, instead of taking the next available flight to SFO... because I would have missed this dinner otherwise. And I was so grateful that I took the 8:30 p.m. seating! We were led to a table facing the kitchen, where my friend Ducky and I were seated side-by-side... rather intimately. One of our neighbors looked vaguely familiar and we kinda figured he was a famous musician of some sort. At the end of the evening, we found out that it was actually Kirk Hammett - the guitarist for Metallica. What a soft-spoken gentlemen he turned out to be. After checking our dietary restrictions, we were told that there would be about 15 courses coming our way. We were both pretty hungry by now, and eagerly awaited for the food to arrive. But my string of bad luck seemed to have continued even in San Francisco. As I was going through my usual routine of setting white balance for my camera, something weird seemed to be happening. Many of the pictures had dark shadows across part or even all of the frame, and it seemed to occur mostly when the camera was pointed at a downward angle. I was never able to properly set white balance, and was pretty much frustrated the whole evening trying to get in a decent shot of each dish. Infusion of home herbs from our garden - our server poured some Meyer lemon-infused hot water into the tea cup, letting the flavors of the herbs infuse into the liquid. While the fragrance and flavors of the Meyer lemon was immediately recognizable, there were also sweeter flavors that came later, almost anise-like. Tomato - the tomato is from the restaurant's own garden, garnished with grilled tomato gelée and aromatic herbs on top. At the bottom there was some corn pudding and tomato preserved in the wood oven. I thought this was pretty good, as I love the umami flavors of a tomato essence. The basil and mint on top were especially intense in terms of flavors. 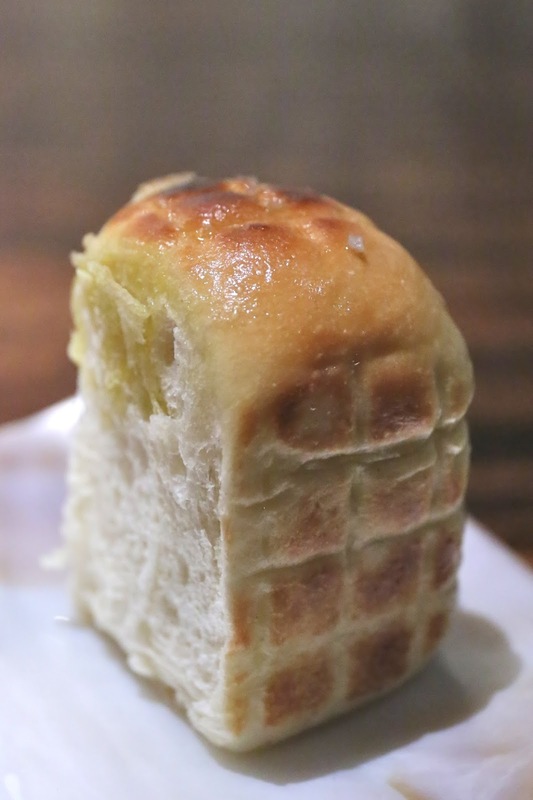 The Parker House roll on the side was lightly grilled and brushed with smoked (something that I didn't catch)... Definitely got the smoky flavors, and the roll was a little salty than I expected. Broth of grilled roots - giant radishes stuffed with scallops and sea cucumbers, soaked in the broth of grilled root vegetables. Loved the radishes, and we were trying to figure out whether they cooked the radish separately from the "stuffing". I thought both pieces were stuffed with scallop... Oh well. Nice charring on the radish giving plenty of of smokiness. The scallop was done mi-cuit. The broth definitely tasted of dashi (出汁), but we thought there was also some butter or cream mixed in. The broth also had shaved yuzu (柚子) rind, giving it a little bit of citrus fragrance. Spot prawn - from Half Moon Bay, freshly killed about 10 minutes prior to serving. With grated daikon and jalapeño, as well as greens on the plate. We could dip the prawn with either the toasted seaweed salt or the citronette on the side. The prawn itself was delicious and just barely cooked. Not a fan of the lettuce that covered it, though. The seaweed salt was surprisingly meh, but the citronette was full of shellfish broth and had loads of umami. Battle creek trout, its skin and roe - a beautiful presentation. The trout was smoked in the wood oven, with the crispy skin on top. Abalone, grilled over the embers, sauce of the liver and capers - Monterey abalone with kelp. Lifting the kelp cover revealed the abalone, grilled artichoke, rice, and the liver sauce. So I guess everyone's doing abalone with liver sauce these days... Not bad. Custard - Saison's version of a chawanmushi (茶碗蒸し), made with very creamy Red Hawk cheese on top, with pickled green onions which tasted sweet. Brassica leaves, blistered in the fire, broth of the cultured vegetables - all types of leaves from the Brassica family such as kale, cabbage, leafy mustard... with some "fermented cabbage" at the bottom. Side view shows the other leaves underneath. I thought there was also some radicchio or red cabbage. Anyway... Ducky tasted the "fermented cabbage" and immediately declared that this was simply "washed down kimchi made by a white person who is vegan"... Well, I guess that's what a Korean would say... As for me, I just thought it tasted a little like sauerkraut... But I really did enjoy the roasted kale. Duck - roasted in embers, with neck, tenderloin, and 2 pieces of loin. Garnished with both fresh and dehydrated gooseberries. Duck was served with Saison hot sauce, which has a hint of cumin. Duck bone broth - infused with mitsuba (三つ葉). Ice cream and caramel, cooked in the fire - smoked cow’s milk, smoked and churned into ice cream. Topped with cocoa nibs along with salted and smoked caramel. Very, very smoky and yummy. Love. Citrus and tea - looks cute. Citrus sorbet (or ice cream, since it has buttermilk?) made with mandarin orange, with chunks at the bottom. Texture was very smooth and different. Turns out this was made with a Pacojet. There was also a pot of sobacha (そば茶). Wild berries - from California. Delicious. I browsed through the impressive wine list of the restaurant a couple of weeks ago, and decided it would be far more economical to bring my own wine and pay corkage... since I have a couple of hundred bottles lying just north of the city. 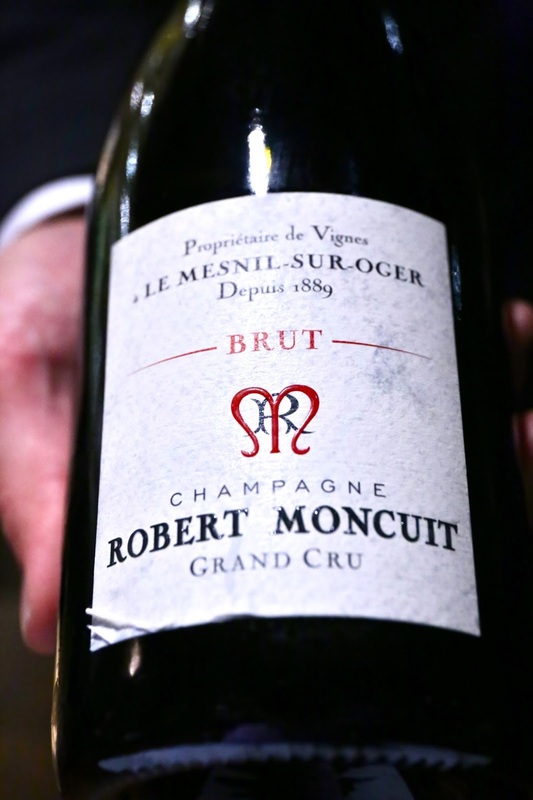 Robert Moncuit Le Mesnil-sur-Oger - nice and a little yeasty. Ripe on the palate. 2006 Kistler Pinot Noir Bodegas Headlands Vineyard Cuvée Elizabeth - nose was really sweet, so incredibly sugarly, so fragrant... with cedar and almost floral notes. More than an hour and a half later, there were more mineral and metallic notes. What a beautiful wine! P.S. We were listening to mostly 80s music throughout the entire evening, which was pretty cool to me but probably a lot less meaningful to Ducky. I asked Michael about it at the end of dinner, and was told that it was Chef Josh's idea to keep things less stuffy and more casual - in line with their "come as you are" attitude. Indeed, a neighboring table were occupied by guests in shorts - similar to my experience with Martin Berasategui in Spain. Whatever the reason, I was pretty happy!